Quezal - pattern #7874. 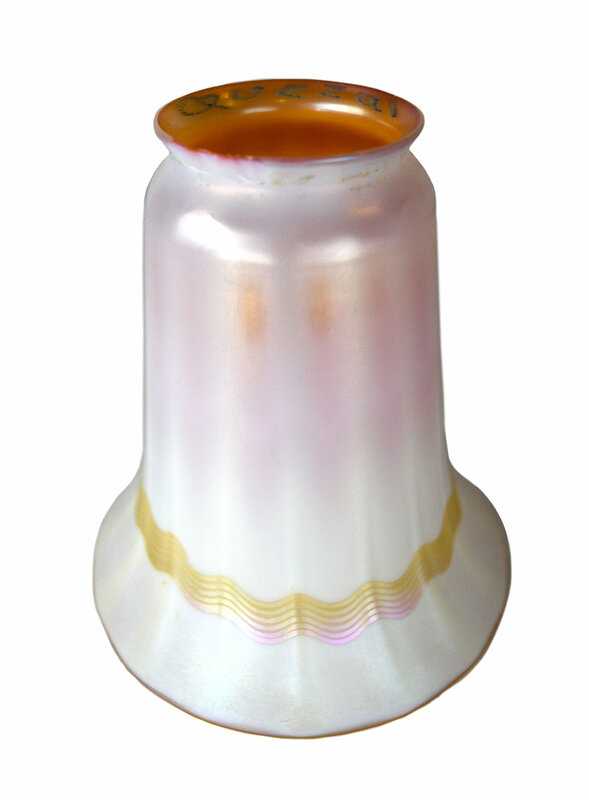 Gold lined with gold ribbon around base. 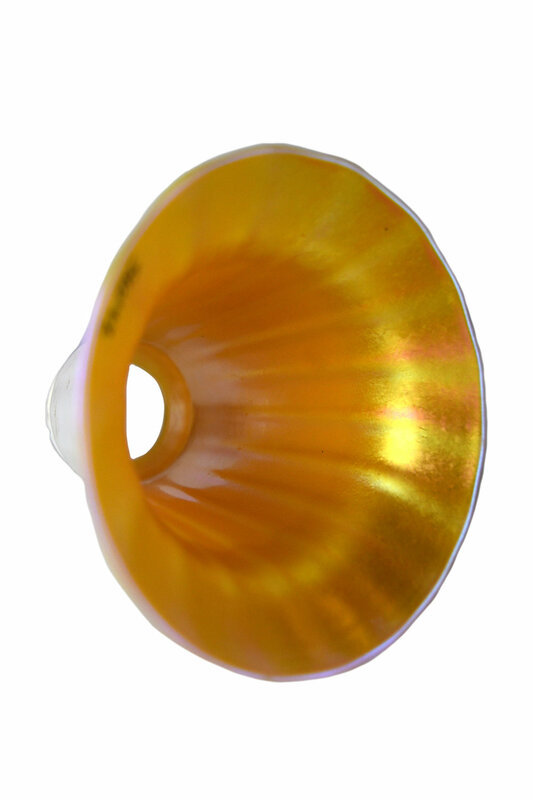 Many of the glass manufacturers from the late 19th and early 20th centuries had ties to one another, whether from working together or for each other, and Quezal is a perfect example of the era's interconnectedness. The firm was founded in 1901 by Martin Bach Sr, Thomas Johnson, Nicholas Bach, Lena Scholtz, and Adolph Demuth, many of them former Tiffany employees. Their work was notable for its use of bold iridescent colors, such as blue, gold, purple, and green. From the beginning Quezal was considered the first real competition for Tiffany. They soon had their own competition though, when two of its employees branched out and started their own firm, Lustre Art Company! Eventually Martin Bach Sr became the majority owner in the company, and when he died in 1921 his son took over. Martin Bach Jr was not as adept as a businessman, however, and Quezal closed in 1924. 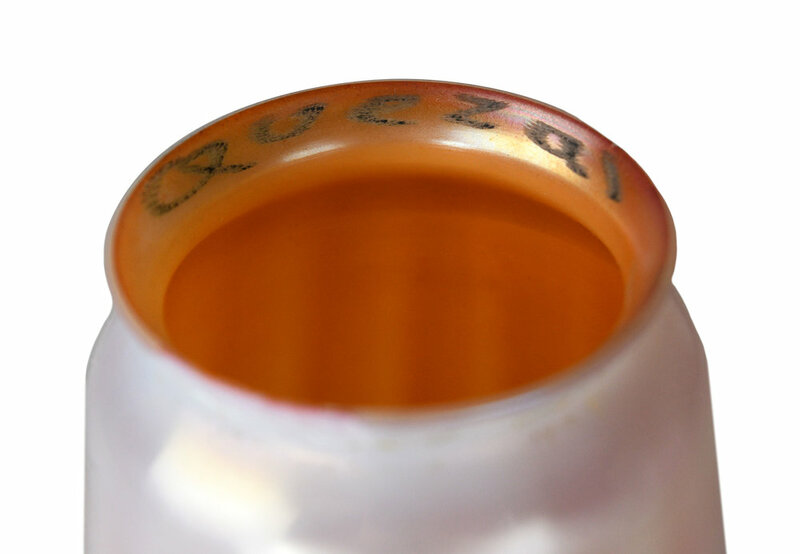 Even with a couple of decades worth of inventory, Quezal kept its production limited compared to their contemporaries, so the surviving pieces are sometimes hard to come by. $24.99 shipping within the continental United States. International shipping also available. Please contact us for a quote. Be sure to include the Product ID AA#s1042 when making your offer.